The Pennsylvania Power Library boasts a wide array of online resources suited to entertainment and education alike. 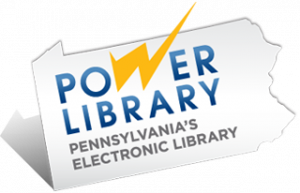 For a complete list of resources and more thorough descriptions of each, please visit the Pennsylvania Power Library: E-Resources page. Note: Some of these services may require a library card if you are accessing them from home. This electronic library offers a list of useful e-resources and links to online collections curated by Pennsylvania universities and libraries. This service supports the information needs of patients and fosters an overall understanding of health-related topics. Content covers all areas of health and wellness from mainstream medicine to the many perspectives of complementary, holistic, and integrated medicine. This site provides e-books that are enhanced with a related content in a variety of text types and media–including primary sources, fiction, videos, audio clips, images, and related websites. Interested in Pennsylvania history? PA Photos and Documents features digital collections of historic materials from libraries across the state. This service puts you in touch with a librarian for reference services at any time of the day or night. Use this service to search more than 2,500 Pennsylvania libraries for a book, DVD, or other item of interest. Library members may take free online courses in a variety of subjects through this service. A powerful tool for local history and genealogy research. This service is only accessible on-site, either through a library computer or your personal phone, tablet, or laptop. Simply connect to the library’s WiFi and dive in! Hundreds of digitized Pennsylvania newspapers are at your fingertips with this service. Use the link above to access Newspapers.com when you are at the library. If you have a Uniontown Public Library card and would like to use this service from home, follow this link to learn how. This growing site hosts the digital collections of select libraries, historical societies, museums, and other heritage organizations across Pennsylvania. This catalog allows you to search the collections of thousands of libraries around the world. A collection of reference links curated by the Carnegie Library of Pittsburgh, including topics such as current events, food, home and garden, family history, science and technology, music, and languages. Offered by the Goodwill Community Foundation, this site hosts tutorials on technology basics, money management, health and safety, reading, math, and other topics for personal and professional enrichment. Studying for your driver’s permit or license? Visit this site for practice tests and for Frequently Asked Questions regarding Pennsylvania’s exams. This electronic library offers fun, educational e-resources for kids provided by the Pennsylvania Department of Education. If you are really stuck with a homework problem, try Chat with a Librarian. You will be linked to a live person who will help you with your question. This site will provide help to students of all ages, even those in college. This site offers over 9,000 interactive books, games, puzzles, and other learning activities, all geared toward small children (ages 2-8). Scholastic BookFlix is a new online literacy resource for grades pre-K-3 that pairs classic video storybooks from Weston Woods with related nonfiction e-books from Scholastic to help build a love of reading and learning. This service is provided through the Pennsylvania Power Library. Visit this site to explore subjects ranging from the Civil War to Ecosystems to Disasters through videos and interactive Scholastic e-books. This service is provided through the Pennsylvania Power Library. Help your preschooler prepare for kindergarten with this online gameboard designed to develop their literacy, math, and science skills. For book recommendations, explore the program’s Book Talks on YouTube. Kid-friendly games, videos, and other activities provided by the Public Broadcasting System. The Between the Lions page is particularly focused on early literacy. This site has children’s music for every occasion, from folk songs to holiday tunes to music about science or the seasons. Nature and science-oriented games, quizzes, and articles adapted for children from National Geographic. Is there a future astronaut in your family? This site not only has outer space-themed games and puzzles, but photos from the International Space Station and fun facts about the ISS crew. Check out the “Animals” page to learn about the wildlife at the National Zoo in Washington, DC. Live webcams showing the elephants, lions, and pandas are also online! Speaking of wildlife, how about some creatures you might see in your own backyard? This site includes photos and printable coloring pages. Created by the National Security Administration, this site features brainteaser games, information on code-making and breaking, and even tips to help children safely navigate the Internet. The Private Industry Council is focused on “building tomorrow’s workforce in southwestern Pennsylvania through early childhood development, employment and training, education, and business services.” Visit this site to learn more about how PIC might help you with your job search. Launched in 2012, JobGateway is a service of PA CareerLink and an initiative of the Pennsylvania Department of Labor and Industry. This site not only enables you to search hundreds of thousands of jobs across the state, but also allows you to upload a resume and make it available to employers. A publication of the PA Center for Workforce Information and Analysis, this guide offers tips and resources for all stages of your job search. It includes an interest assessment tool for those who are still choosing a career path, descriptions of average wages and job openings in different fields, and suggestions for how to strengthen your resume. This is the Federal government’s official job search website. Use this site to find work with various departments and offices of the United States government. Use this site to learn about different jobs, their earning potential, and the educational paths that you might take to begin your career. This site offered by the League of Women Voters allows you to preview the ballot for the May 2018 Primary and learn where the candidates stand on different issues. The United Way of Pennsylvania surveyed the 2018 candidates for PA Governor on the subjects of the state budget, financial responsibility, education, community strengthening, and health. Their responses are recorded on this site. Designed for PA residents, this site provides information on the voting process in Pennsylvania, how to register to vote, and how to file election complaints. Check out this resource to expand your knowledge of federal, state, and local politics in Pennsylvania, in addition to the major policy issues affecting our state. This free online book was produced by the Pennsylvania Municipal League in an effort to help Pennsylvania residents understand how their government is organized. Geared toward educators, this site offers election and debate-themed lesson plans, information on the voting process, and an interactive electoral map that lets you predict the winners state by state. As the title implies, this nonpartisan service fact-checks the claims of politicians and public figures. The site also delves into the truth behind matters that affect public policy. Operated by the U.S. National Library of Medicine, this site offers easy-to-understand information about medical conditions, the human body, and general wellness. You can also learn about different surgeries, medical terms, and the side effects and precautions associated with certain drugs, herbs, and supplements. The CDC’s website is not only helpful for learning about various diseases and conditions, but also for finding timely health-related information with regard to travel and emergency situations. The U.S. Department of Health and Human Services maintains this site about the vaccination process. Here, you can learn about diseases that may be prevented with vaccines, where to get vaccinated, and at what age certain vaccinations are recommended. See also the CDC’s website on vaccinations. Maintained by the American Academy of Pediatrics, this site offers information and news particular to the health of children. Of particular interest are the “Ages & Stages” sections, which address the nutritional and physical challenges that children commonly face as they grow up. This user-friendly website explains how genes and DNA work and how your genetics may affect your health. The NIH represents a collection of twenty-seven different medical organizations, each with their own research focus. This site by the National Institutes of Health hosts a variety of databases on environmental health, hazardous chemicals, occupational disease, and the effects of exposure to common household chemicals. Want to learn more about a particular kind of medication? This portal collects information from the National Library of Medicine and other government agencies on more than 30,000 drugs. Visit Khan Academy for free online courses in a wide variety of subject areas. Interested in exploring the field of data science? This website offers information on educational programs and careers, along with related resources.